A few months ago I bought a Yamaha TTR-50E for my son, Cole, who is 6-years-old. He has absolutely loved his dirt bike and I’m glad I bought it. 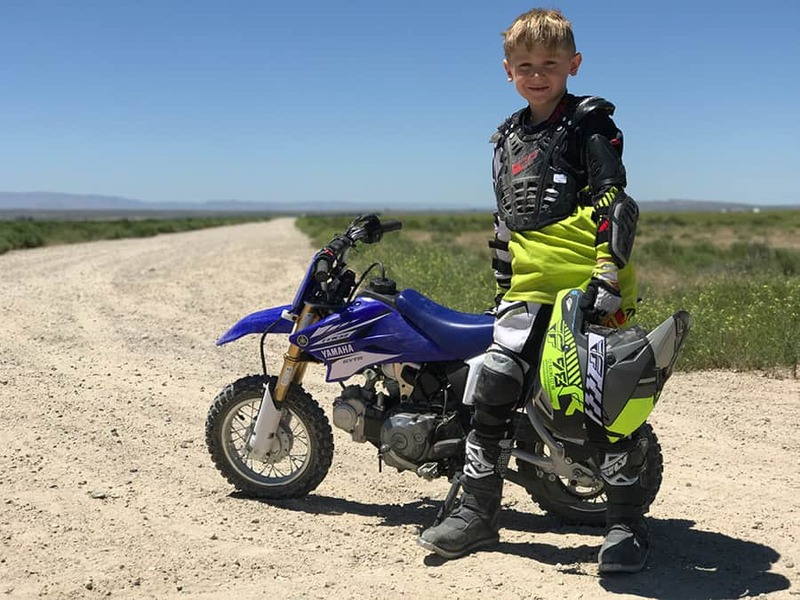 The Yamaha TTR-50 is not a perfect bike and in this review, I’ll outline some of the things that are wrong with the bike; however, all-in-all it’s a very solid dirt bike for kids and is a good purchase. The bike offers a lot of features, such as electric start, inverted fork, front and rear drum brakes, and a large drive chain for lower maintenance. If you’ll be buying your kid a dirt bike, please do yourself a favor and save tons on their safety gear by reading my post on the best kids safety gear we’ve found. I’ve had this bike for a few months now and we’ve been riding a few times a week out in the desert. We have not had any serious reliability concerns, but there are a few things to be aware of with the bike. After a few light crashes, the throttle grip got pushed into the metal bar–causing it to stick. To fix this, I pulled it out a 1/4″ and tightened the screw to the left of the throttle guard to make sure that didn’t happen again. It was too loose from the factory. The shift lever was bent, so I replaced it with this one from Amazon. I noticed on Youtube videos that several other TTR50 owning Dads bought this same new shift lever for the bikes, which I think means it’s safe to say that the stock shift lever just isn’t strong enough. But this was an easy 3-minute fix and relatively inexpensive. If you buy a TTR-50, I’d just go ahead and buy the new shift lever right away. The bike’s engine got flooded a few times when I first took the kids out. The issue was that the kids were crashing like every 50 feet, so the bike spent as much time on its side as it did standing up. The oil just soaked up the air filter too much and it couldn’t breathe. The fix was to remove the air filter cover and just lightly squeeze out some of that oil. The filter DOES NEED TO BE COVERED IN OIL, but it was absolutely soaked through and coming out the dump valve. I had a hard time getting the engine to start the first two or three trips. This was user error and I just needed to get used to how it works. What ended up working for me was starting with no throttle at all and no choke at all, and then being sure not to let it just idle for the first 45 seconds. Sit there and keep giving it some throttle after it starts until it can start going steady on its own. This, again, was just me getting used to the bike and not an issue with the starter. In a particularly insane crash where my son got whiskey throttled and sent flying toward a jump, the front fender plastic snapped off. This was a $40 replacement. No big deal. We accidentally turned the bike off with the kill switch once and left the key in the “on” position. This, of course, killed the battery and it was dead the next time we went out. We were able to do a push start, but we bought a smart charger for it so we could fix the bike if that happened again. You absolutely NEED to own a smart charger (like this one on Amazon) if you buy this bike. That’s it! Those are the only issues I’ve had with the dirt bike for the first few months. Almost all of these things are similar to what you’d see with any dirt bike. I’m NOT at all a good mechanic and I haven’t had issues in maintaining the bike. Everything so far as been easily fixed after a few Youtube searches. Overall I’m happy with the purchase and would buy it again if I could go back. Nope, no kick starter. If you’re wanting to buy the best 50cc dirt bike, a lot of people will choose the Honda CRF50 for this reason. However, I actually don’t think it’s as big of a deal as most people make it out to be. Kids who ride a 50cc bike generally are not strong enough to kick start it. Some kids can do it with a few tries, but most won’t be able to. My 6-year-old can’t do it even though he’s a pretty athletic kid. My 8-year-old can kick start a bike but it’s not easy for him. The issue here is not so much strength as it is weight. Heavier kids who jump up and come down on the kick start will get it going, but a little 45 pound 6-year-old just can’t quite do it. So the kick starter is really only helpful for the dad. Also, it’s not as if you’re out of luck if the battery dies. You can always do a push start. I certainly wish Yamaha put a kick start on this bike to more closely compete with the Honda, but I also don’t know if it’s as big of a deal as some people make it out to be. Just buy the one that you find at a good price. This is my son, Ruger (8-years-old), standing next to a Yamaha TTR50 dirt bike. The 50cc bike is too small for him, but it REALLY helped him to gain confidence quickly on a smaller bike for the first several rides before he got a larger bike. The TTR-50 is a great fit for most kids between 3-years-old and 7-years-old. I know a family with little girls aged 11, 9, and 7 and all of the girls just want to ride the 50cc bike and not the family’s larger bikes; however, most kids starting at around 8-years-old would more properly fit a larger bike. The seat height of the TTR-50 is 21.5″ (54.6cm). This means that most kids will be able to touch the ground with a flat foot at age 7. Generally, a flat foot means the bike is slightly undersized for the rider; however, my experience with kids is that they feel much more confident learning on a bike where they can touch flat footed. Otherwise, they crash every time they come to a stop because they have to lean the bike over too much to put a foot down, and the weight of the bike just knocks them over. The bike is quite heavy at 126 pounds weight weight, but that’s similar to the weight of other 4-stroke 50cc bikes. It takes the kids a while to learn how far they can lean before the bike’s weight overpowers them. Some people put training wheels on this bike for the little ones to learn on. I would do that if I had a 3 or 4-year-old, but my youngest rider is 6 right now so I didn’t let him use training wheels. The first two trips were frustrating for him and he fell over every 50 feet most of the time. Most of his falls were just because he was afraid. However, we got out there the third trip and BOOM! The kids totally took to it and were riding champs. This is a serious dirt bike and not a toy like the little Razr “dirt bikes.” It will go 32 miles per hour even with an adult’s weight on the bike (I know because I checked). For safety, the bike does have a throttle stop. This is a long bolt coming out from under the throttle which you can screw in to lower the max speed of the bike. I personally haven’t felt the need to set the throttle stop because I just keep my kids in second gear 100% of the time and that already limits their speed. The kids rarely even get to full throttle in second gear because they get scared going too fast, so this hasn’t been an issue for me. If you just start the bike in neutral and then throw it into second gear before they even get on the bike, you’ll be set. They won’t need to change gears all day long. One thing to mention is that this bike is faster than the Honda CRF50. The Honda taps out at a little under 25mph, while this goes to 32 mph. This is my 6-year-old boy, Cole, riding is Yamaha TTR50E. The TTR50 uses a 49cc engine that is solid and reliable as any. The engine is air-cooled so you probably don’t want to leave it idling for more than 6-7 minutes, since it requires the air movement of riding to cool the engine. In my opinion, this is a really nice feature to be air-cooled because it cuts down on the parts that can break and the maintenance. The bike uses a 3-speed automatic clutch so the kids can switch gears on the fly without worrying about a clutch. However, my kids just stay in 2nd gear for everything except for starting. The bike comes with a spark arrestor, so you don’t have to worry about riding out in the desert where there will be restrictions. I bought my kid’s TTR50 for $1,300 brand new off the showroom floor at Snake River Yamaha in Meridian, Idaho. However, after all of the taxes, registration and fees, it was closer to $1,800. If you can find a TTR50 that is only a few years old on Craigslist, BUY IT! I definitely would have bought lightly used if I had found one available.